Programming and designing elevator recall for fire alarm systems is a fairly simple process if you are familiar with the codes and standards in place. 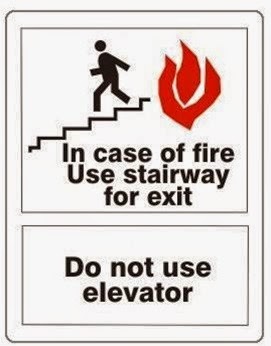 Most fire alarm programmers and contractors understand the principle behind capturing passenger elevators but for those of you that don't, check this out! 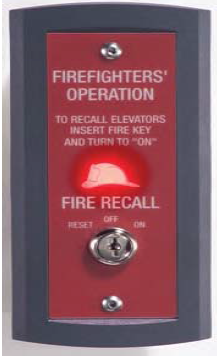 Elevators are required by code to be connected and controlled by a Building Fire Alarm System (NFPA 72 2013 3.3.105.4.1) or an Elevator Recall System which falls under the NFPA 72 classification of Dedicated Function Fire Alarm System (NFPA 72 2013 3.3.105.4.2). As required by NFPA 72 2013 21.3.5*, the spot type smoke detectors for the use of capturing the passenger elevator shall be mounted within 21' centerline of the elevator door. In addition to these detectors, you will have smoke detector(s) in the elevator machine (EMR) room and at the top of the elevator hoistway. Keep in mind that smoke detection in the elevator shaft is only required if the elevator hoistway has automatic sprinklers. Automatic sprinklers are only found in the elevator hoistway if the elevator is constructed of combustible material. Consult NFPA 13 and the International Building Code for more details. All of these spot type smoke detectors will be associated with your building fire alarm or dedicated function elevator system's elevator recall functions. Regarding the elevator and the building fire alarm system relationship, we have additional functions that require the installation of thermal spot type heat detectors. You will need these thermal spot type heat detectors in the elevator machine room (EMR) and elevator shaft (only if automatic sprinklers are present). Note these heat detectors do not recall or capture the elevators. These thermal heat detectors shunt the power to the elevator controller in the event of a fire. Remember the thermal spot type detectors used for shunt trip are required to be set or programmed to a lower temperature point then the surrounding automatic sprinkler heads. The intent is for the fire alarm system to sense the fire before the automatic sprinkler heads. This way the fire alarm control unit (FACU) can disconnect the power to the elevator controls prior to the sprinkler head applying water to its electronics. You can read more about fire alarm system elevator shunt trip in the following article: elevator shunt trip. NFPA 72 2013 21.3.14.1. Designated Level Recall. All smoke detectors associated with elevator recall that are not installed on the primary floor of egress including the top of the elevator shaft will activate the designated level elevator recall relay. This function will send the elevator car to the main level of exit discharge. (typically lobby floor or level #1 depending on the building layout). NFPA 72 2013 21.3.14.2. Alternate Level Recall. All smoke detectors associated with elevator recall that are installed on the main level of exit discharge will activate the alternate level elevator recall relay. This function will send the passenger elevator to the alternate floor of egress. (typically the basement or 2nd floor depending on the building layout). The floor or level where the elevator equipment room is located will determine the recall relay to be activated in the event of an activated smoke detector. Example: If the elevator machine room (EMR) is located on the first floor, its associated smoke will activate the alternate elevator recall relay. If the elevator machine room is located on the roof, its associated smoke detector will activate the designated elevator recall relay. The heat detectors in the elevator machine room and elevator hoistway will activate the shunt trip relay killing power to the controller. On top of this the heat detectors shall shut off any back-up power to the elevator. Per NFPA 72 2013 section 21.3.14.3* The elevator hoistway and equipment machine room smoke detectors and or heat detectors shall activate a visual warning commonly known as the flashing Fireman's Hat Light near the elevator call buttons. This allows the fire department to become aware if there is a fire in the hoistway or elevator machine room. Now programming all of this might seem difficult but it is actually really simple. Get basic instructions on how the programming breaks down in this article: fire alarm system with elevator recall. It is a really great idea to connect the fire system alarm to the elevator system.